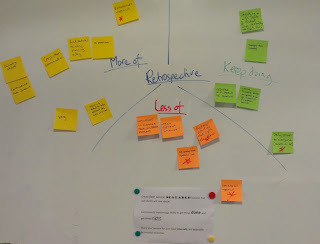 One of my responsibilities as a Scrum Master is to facilitate our team's fortnightly retrospective. I like to experiment quite a lot with most things, and retrospectives are no exception. Our last two sessions used different formats that I thought may be of interest to others. As a caveat, many of my ideas (and this very blog post) was inspired by a recent article from the lovely people at +TargetProcess , on different retrospective styles (of course!). Create fast, secure, scalable features that our clients will rave about. Continuously improve our ability to get things done and get things right. Share your passion for your work internally and externally. These goals apply to every Software Engineer at New Voice Media and so we should also embody them as a team (we're hiring, by the way, Developers, a Product Owner, Op's Engineers and more - contact me if you're interested). The team spent 5 minutes writing ideas on stickies which were colour coded by section. Once everyone had posted their stickies on the board, we discussed each one and then starred the ones requiring significant action. This format was great as it provided a concrete, visual focus for guiding our reflections, as the picture below shows. If your team is about to experience significant change, then a retrospective is a useful setting for sowing seeds and facilitating preparation. Our Development Team will increase in size by 25% over the course of January (did you miss that we're hiring), and we're likely to add another 25% over the remainder of Q1, some of whom will be in a separate location. For our last retrospective of the year, I therefore made this our focus. We discussed the short and longer term changes that the team would be experiencing (cultural, as well as numerical) and shared thoughts on how this would impact us. 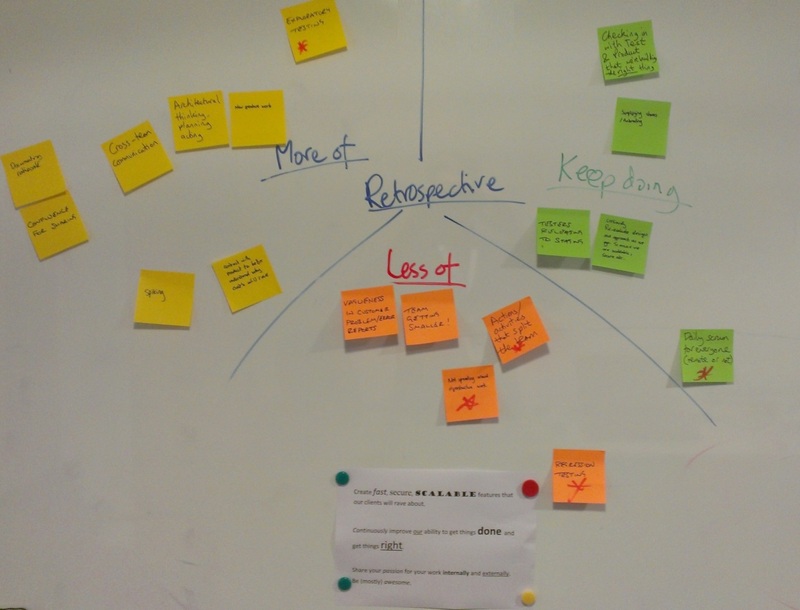 Applying the retrospective label to this approach may be a stretch, but I felt that it was necessary to improve the team's readiness for change. I'll let you know how well we actually responded to the growth in a few months! In summary, it's important to experiment with the retrospective format and hopefully the two I've shared will help you do that. To improve our improving (which is what retrospectives are all about), it's important that we regularly apply the adjust part of the plan-do-check-adjust cycle to the retrospective itself.